Cockroaches have six legs, and two antennae. Adults are about 1/2 – 5/8 inches long. The color varies from tan to light brown. They have fully-developed wings, but do not fly. German cockroaches are best identified by their small size and two dark, parallel lines running from the back of the head to the wings. Their wide, flat bodies enable them to easily move in and out of narrow openings. 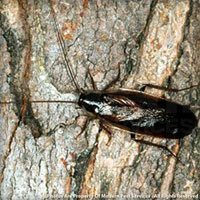 Cockroaches have an acrid odor which may permeate items they come in contact with. 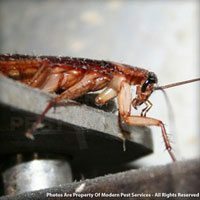 There are 3,500 different species of cockroaches worldwide, with 55 found in the United States. Of these, the German cockroach is the most common. 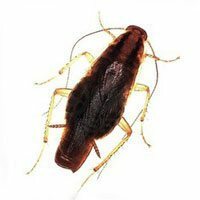 This species is found in houses, apartments, restaurants, hotels, and other institutions throughout the United States and most parts of the world. They prefer dark, damp places with a plentiful food supply. They hide during the day in warm, dark places, such as under sinks, behind dishwashers, stoves and refrigerators, and inside cupboards. They are primarily active at night when they are foraging for sustenance and mates. German cockroaches will feed on a wide variety of foods, especially starchy and sugary materials, including book bindings, photographic film, linens, leather goods and numerous food items. Some of their favorite foods include starches, sweets, grease, and meat products. They usually forage at night. Cockroaches can survive a month or more without food, but less than two weeks without water. 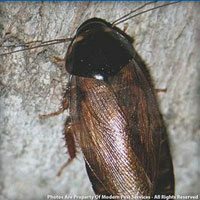 Under optimum conditions, cockroaches can produce two million offspring in one year, with an average breeding season resulting in 350,000 offspring. The female carries her egg capsule, which contains 30 – 40 eggs, partially within her abdomen, until 1 – 2 days before hatching. She will deposit them in a safe and sheltered area. From egg to adult takes an average of 103 days.